After managing to keep DD up last night we were hoping for us all to be on a much more acceptable wake up time. I woke around 6.15am and everyone else was still asleep, result! Dd and DH both woke just before 7. DD had her usual bowl of the awful things that are fruit loops - minus the yellow ones because &lsquo;they're disgusting'. This mornings plan was animal kingdom, we left at 8.40 and getting into the car park was manic, took ages to get through the pay booths. After getting parked and walking to the park entrance bag search also had long queues, eventually we entered the park around 9.45. Our first stop was our fastpass for dinosaur, Dd has never been on this so we weren't sure how it would go down. It's pretty much just being shaken around in the dark for most of it but we all enjoyed it and Dd gave it a big thumbs up. After this we walked through dinoland and towards the animal walking trails, this is something we've never done in all our visits. 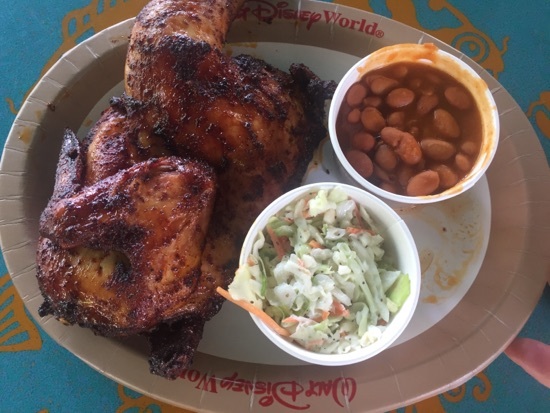 By 11am we were all feeling hungry so wandered over to flame tree bbq. DH had the half a chicken with coleslaw and beans, this is his usual here and it was as good as always, he thoroughly enjoyed this. Dd asked for a hot dog on the way to flame tree and fortunately they have a kids one on the menu. 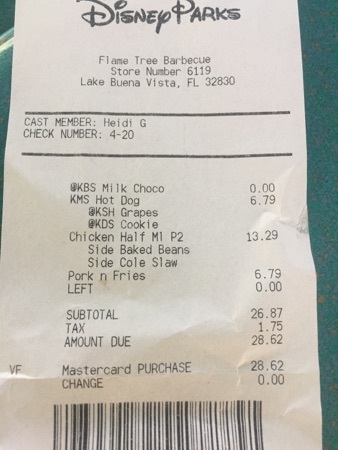 This came with the choice of 2 sides and a drink so she had grapes and a cookie and a bottle of chocolate milk $6.79. She ate every single bite of this so I'm guessing it was good, so good she managed to sneak a bite before I got a photo! 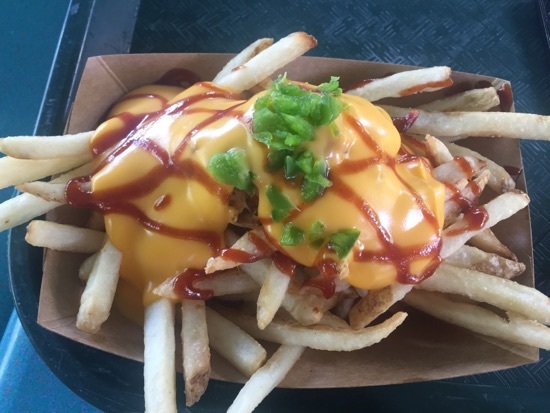 I ordered the fries topped with pulled pork and cheese, these were amazing, there's not a huge amount of pulled pork but the cheese and bbq sauce go so well together with the fries, they were topped with what I though was green pepper but it was hot so I'm guessing it was chilli. These were just enough for a light lunch. 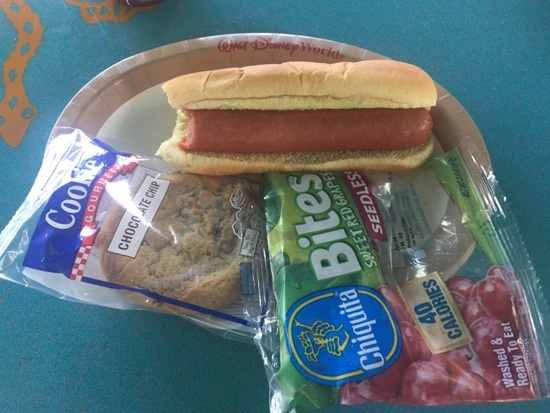 Lunch came to $28.62 in total, it is totally possible to eat in the theme parks well and on a budget. After lunch we had our next fastpass for Kali river rapids, the fastpass queue for this was so slow, it took over 20 minutes to get on the ride, this was much quicker that the standby queue which was showing at 95 minutes. We all love this ride and the whole raft got completely drenched this time! 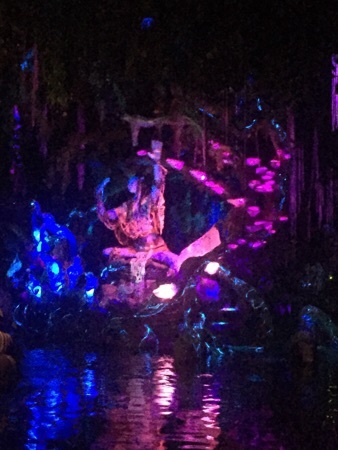 After getting off Kali we walked round to Pandora for our fastpass for na'vi river journey. This ride's nice but I wouldn't queue for 2 hours for it like people were today. 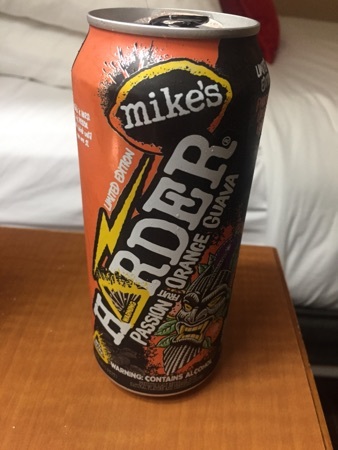 After na'vi we stopped off to get a night blossom to share, this was $5.69 and me and Dd loved it. 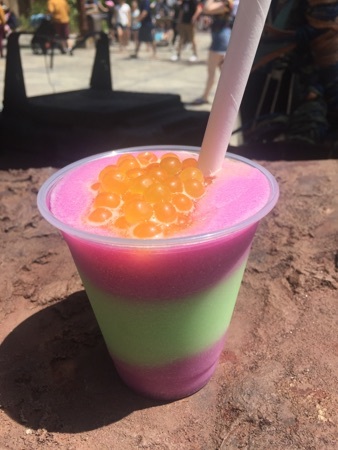 The boba balls on top are passion fruit flavoured and the frozen drink is quite sour and tastes abit like the sweets opal fruits. 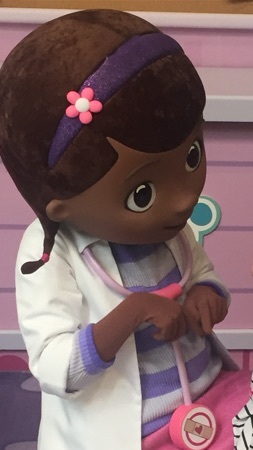 We then decided to visit rakifi's planet watch, we got the train over and spent some time meeting doc mcstuffins and stroking the different animals in the affection section. Whilst over there I managed to secure a 4th fastpass for Kali river rapids. We got the train back to harambe and walked round to Kali for another go, the fastpass queue moved much much quicker this time and we didn't get half as wet as earlier. At this point we decided to call it a day, weMd had a slow paced day and spent 7 really enjoyable hours in animal kingdom. This is normally our least favourite park and we only spend about 3 hours here at a time, some holidays we've been known to not visit AK at all, but today we saw a completely different side to the park and had an absolutely fantastic time. The plan for tonight's dinner had been kobe but when I tried for a reservation earlier there was nothing until 8pm and this would be too late for Dd, we decided to drive over to Disney springs instead as there's lots of things we like/want to try there. 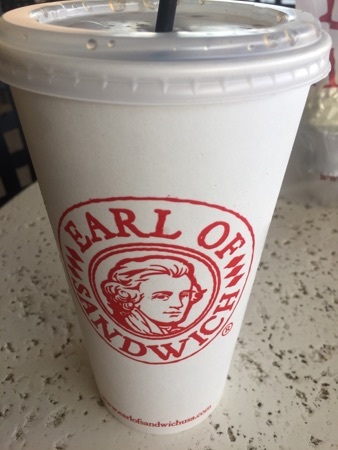 We parked up in the lime garage on the top floor and headed down to earl of sandwich for some food. 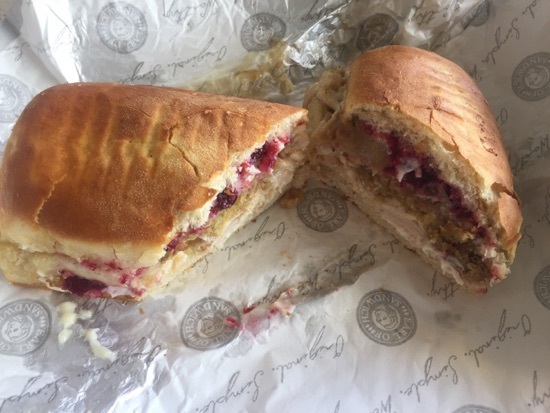 DH and I settled on our usual, the holiday turkey sandwich, this is turkey with cranberry and cornbread stuffing mayonnaise. I thought this was as good as ever but DH didn't think it was, he thought maybe the filling wasn't as spread out as usual. Dd had a side of Mac and cheese for her dinner, DH and I also got one of these to share between us with our sandwiches. 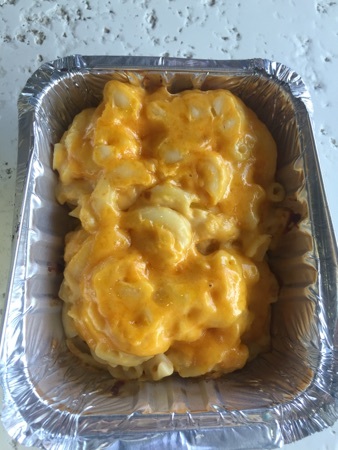 This is really good mac and cheese but really salty. We got a large fountain drink (coke) to share between us. 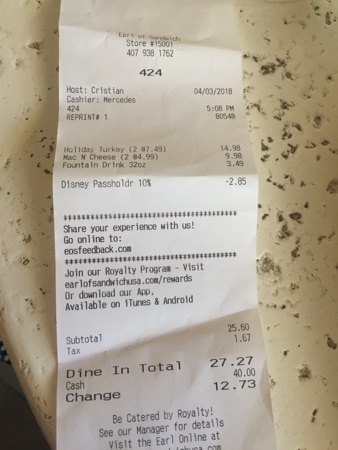 The earl does DVC discount so our total for dinner came to $27.27. We didn't want a huge meal and we wanted to leave room for dessert. After a wander round a few of the shops but no purchases we popped into ghirardelli for dessert. We ordered a Chrissy field sundae to share between the 3 of us. 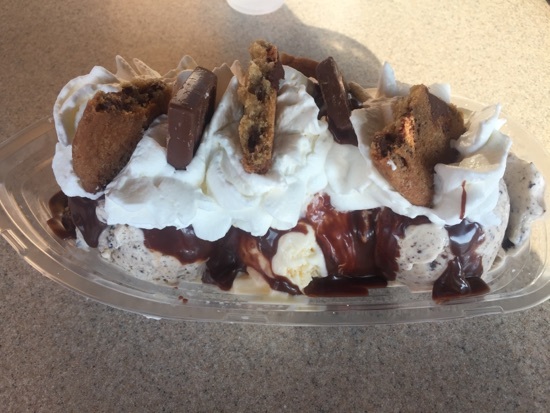 This is 2 scoops of cookie dough ice cream, a scoop of vanilla, chocolate sauce, squirty cream, chocolate chip cookie and ghirardelli chocolate squares. This is so delicious and I was absolutely stuffed by the time we were finished. 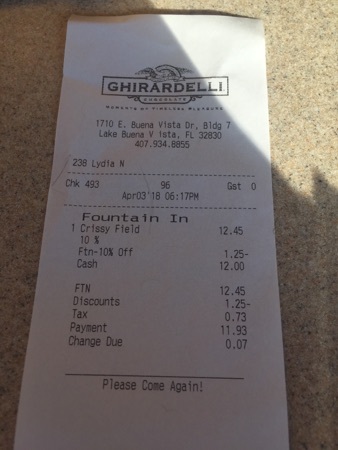 Ghirardelli also does DVC discount so this came to $11.93. We walked round to sprinkles and I used the cupcake atm for the first time, I love how novel this is. I had wanted a salted caramel one but they had ran out so I settled for the chocolate marshmallow one. These come delivered thought the atm in a cute little box, if only they would survive the journey home to England! This cost $5.69 and the plan is to have this for breakfast. At this point we decided to call it a day and drive back to the hotel, it was now 8pm and we were felling pretty tired. We called into the speedway petrol station next to boardwalk for some more drinks for the room. When we got back I cracked open this passion fruit, orange and guava lemonade. New Photo Added by missdopey - 4 Apr 18 2:33 AM. I love the Animal Kingdom, DH not so much, but we have to go every time and he enjoys it when we're there. Sounds like you had a fab day. You can't beat a bit of EoS and also that ice cream looks amazing. 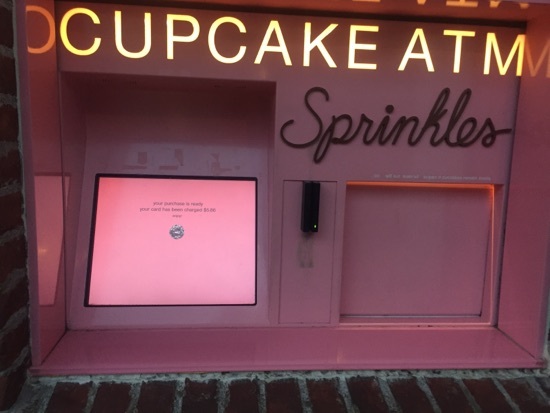 I'll definitely be giving the cupcake atm a try on our next visit. Just catching up on your report - really good, and am looking forward to reading more. The Ghirardelli dessert looked delicious, as did those fries and chicken from Flame Tree BBQ. 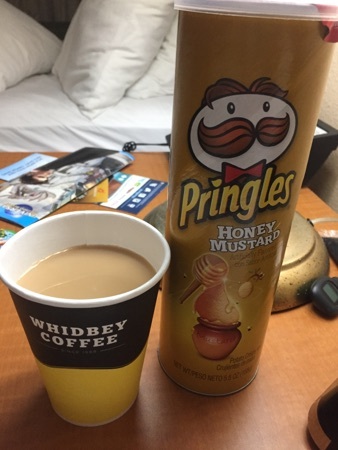 I need honey mustard pringles in my life ! Love a holiday sandwich at EoS. I love Animal Kingdom - we usually make it our first Disney park. 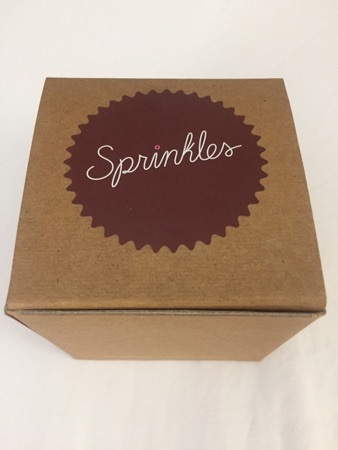 The Ghirardelli dessert looks delicious and I so want to try the cupcake ATM - hope it tasted nice!